1. Sea Ray – one of the largest manufacturers of pleasure power boats for sale, Sea Ray is always highly rated and has been ranked #1 for several years. 2. Bayliner – from small power boats to deck boats, Bayliner has it all. Bayliner has been delivering as a power boat manufacturer since 1957 and is showing no signs of stopping. 3. Mastercraft – setting the standard in power boat manufacturing, Mastercraft offers innovative styles and pricing. 4. Baja – with the slogan “speed changes you,” Baja receives exceptional power boat reviews and sets the standard for quality boating. 5. Boston Whaler – a legend on the tides and waves, Boston Whaler deserves a spot on the top 10 power boat manufacturers list for their craftsmanship, durability and celebrated enjoyment. 6. Ranger – for fishing fans, taste the open seas with Ranger, the power boat manufacturers that cut loose on the waters. 7. Malibu – capturing the essence of power boat manufacturers, delight yourself with a Malibu boat line that includes everything from catamaran power boats to wakeboards. 8. 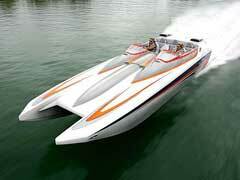 Grady-White – real power boats for power boat enthusiasts, Grady-White sells some of the largest boats ever created. 9. Wellcraft – cruisers, power boats encompass this power boat manufacturer’s line of products that delight in creativity and quality. 10. Chaparral – the leader in fiberglass boats, this power boat manufacturer sets the tone for award winning yachts, power boats and innovation. This particular power boat manufacturer has boats for sale as low as $20 thousand and has many different packages for the water lover.